Pacific Ocean - U.S. Navy file photo of guided-missile cruiser USS Lake Champlain (CG 57), littoral combat ship USS Freedom (LCS 1), and guided-missile destroyer USS Paul Hamilton (DDG 60), October 2014. PEARL HARBOR - Five U.S. Navy ships are scheduled to participate in an independent deployer certification exercise (IDCERTEX) in the Southern California and Hawaii operating areas Feb. 9-20. IDCERTEX will provide a multi-ship environment to train and certify independent deployers in surface warfare, air defense, maritime interception operations, command and control/information warfare, command, control, computers and combat systems intelligence and mine warfare. The exercise led by Commander, U.S. 3rd Fleet (C3F) and executed by Commander, Carrier Strike Group Fifteen (CSG 15), will include the guided-missile cruisers USS Lake Champlain (CG 57), USS Chosin (CG 65), guided-missile destroyers USS Preble (DDG 88), USS Chafee (DDG 90) and Littoral Combat Ship USS Freedom (LCS 1). 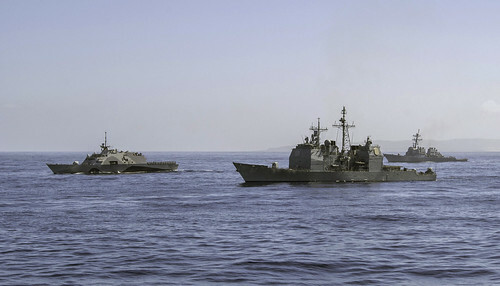 Chosin, Preble and Chafee will conduct their training in the Hawaii operating area, while Lake Champlain and Freedom will participate off the coast of Southern California. IDCERTEX will serve as CSG 15's final opportunity to evaluate and certify Preble, Chafee and Sailors from USS Fort Worth (LCS 3) Crew 102, embarked aboard Freedom, across multiple warfare areas prior to regularly scheduled deployments. IDCERTEX will begin with unit-level training specific to the ship that requires training in shipboard firefighting, man-overboard drills, visit, board, search, and seizure (VBSS), and other ship specific training. The integrated phase involves training between multiple ships and aircraft and consists of flight operations, submarine tracking, strait transit formations, replenishment-at-sea and other required mission evolutions. "Our primary responsibility is to ensure these ships are certified and ready to execute a wide variety of missions while deployed," said Rear Adm. Joseph Kuzmick, commander of CSG 15. "We look forward to watching Preble, Chafee and Fort Worth Crew 102 operate in a multi-ship environment with advanced warfare scenarios." Several supporting staffs will be involved in IDCERTEX including Commander, Naval Surface Forces Pacific, Naval Surface Group Middle Pacific, Commander, Destroyer Squadron 31, Marine Aircraft Group 24, Hawaii Air National Guard and the 25th Combat Aviation Brigade. Freedom is homeported in San Diego and is part of Commander, LCS Squadron One, Naval Surface Forces, U.S. Pacific Fleet and U.S. 3rd Fleet. Leading the naval forces in the Eastern Pacific from the West Coast of North America to the International Date Line, U.S. 3rd Fleet provides realistic, relevant training necessary for an effective global Navy.